I think I haven’t written before about my reasons to do army or even a lot of my plan to do it. So now I will begin it and maybe later also write under this category. Again it comes back to being a musician. In Finland there is little less than 20 professional symphony orchestras. There are not often openings for jobs for clarinet players in those orchestras and the competition is enormous. Many good players arrive also from far away to Finland. So all the time during my studies I’ve seen musicians doing the army service with playing in the bands and even working. I have been also playing in few gigs as a civil servant myself. And even there are only five bands they have more place for clarinetists in one band than in symphony orchestras. If you wish to work in an army band, you have to have Finnish nationality, do the military service and run enough in 12 minutes running test. So this cuts away quite many applicants. Well, also music styles are different but I find it important for a musician to be ready to play every styles. So my life came to a point where I had finished my studies and was not interested to study more at least for some time. I was working too for one year but actually for a while I would like to have a break from teaching. I was still young enough to apply and I had no ties to any people or places that would affect where I should live. So I saw this was the perfect opportunity to apply. Even all the things seemed to come very easy when contacting the right people. And that’s why I ended up moving away from Oulu to Turku. So I have done four weeks of my service now. It is half of the basic training part. I could write you how it is but actually it has been almost just as I imagined before and I’m sure quite many people have some idea. So I try to focus to write on the point of view of a woman musician. And the first thing is of course that I am part of the minority of women in the army. I realized that there is something similar in the musician field. At the moment there is growing a new generation of women musicians but it is not very long time ago when it was not even allowed for women to work in orchestras, as it was not allowed for women to do the military service in Finland. Maybe as a musician I am used to work with guys and to be one of the guys. And I am as good as the guys until it comes to the physical demands. I believe musicians have many different attitudes towards sports but as in my thesis I am really concerned about the physical demands of the playing. So I’ve tried my best to keep myself fit and I was sure I will get in the better shape during my service. But I was surprised how many athletics there are. And I am competing against them so it feels all the time that I am the last one and the weak one. Well, what can I say, I never had any sports hobbies since the music took almost all my free time when I was in the school. But I am still happy that it seems people are encouraging me to do my best. Some part of the training also cause the risk of hurting oneself. I am really careful with my hearing during the shootings. Also I noticed that my hands reacted to the weights that we are holding and I hope my over use syndromes won’t come back. Also when crashing to the ground I have to be very careful with for example my teeth. If I lose a finger or a tooth I won’t be able to play at least for some time. Well, it is not all about the physical part. There are also the discipline and the hierarchy and the other psychological parts of the training. I don’t know if it’s in the Finland in any other institutes so strong but as I’ve studied abroad and took part of international master classes I’ve felt that it’s important in professional level of studying music. You have to have a lot of respect for the “maestros” and professors and to think about how to talk with them. In Finland my relationships with my teachers have been pretty casual. However, in Austria and in Estonia I was expected to behave more respectfully and it was already more part of the culture. I think this might be new for some young Finnish people who are beginning their service and it takes time to get used to it. So with this respect you also learn to take some hard words straight in to your face. Teachers and professors and musicians have been shouting to me about my playing and making me feel like I am a super idiot. So I am not really affected by the shouting in the army when it is for the all the group together. Of course I try to do less mistakes and learn about it and help others to learn. Actually I like those moments when we also have to shout ourselves as loud as we can. I have been thinking about the efficient of the education in the army. The days are long but there are many ways to learn one thing. First lessons and then we practice ourselves and then repeat and repeat. With this style to apply to study music I think the results would be amazing! Of course when I have been teaching I have tried to also add lots of positive energy and understanding and it makes it quite a lot softer training. And I haven’t been teaching in the professional level where all the students are very motivated to progress. But could it be the lack of the discipline that is feels that in Finland the attitude with some young players (like few students I had) is so slack? Actually I have been also observing the people educating us with pedagogical point of view. It comes again to the words and the way you say it. For example if you just shout “You are too slow!” it feels that OK, we can’t do anything about it. But the other way would be “You can do it faster!” and then it is also encouraging to find even more power to do it. As I am quite sure I will also be at some point of the training leading some groups myself, I try to already think about how to work then myself. Military as an institution is a very big and it has a lot of certain things and words that are only needed in that environment. So it’s easy to create also a language around this environment. It’s very similar to musicians’ world and other working fields. If you are not a member of any of these groups you won’t be able to understand people talking. Even one of my friend also commented that I am already using the army slang even I felt I didn’t use it so much. Of course there are moments, for example when digging a pit in the forest, when I was thinking that this are quite extreme stuff to do to for my work as a musician. On the other hand it feels like it doesn’t get me forward with who I am, a musician, but on the other hand it is some how really therapeutic to do something completely different that you would never normally do. And even you didn’t sleep all night or your clothes are completely wet and muddy you realize that you are going to be fine. Those people are still taking care of you and observing every move you do. Also I learn many new things about myself: How I will act when I get tired or the situation is getting more stressful. So the last thing I will write about now is about the badges. Of course we had to begin to learn them right when we came in and already before. And in this point is quite easy when you already know the people who you are talking to and they know you so you don’t get so nervous. But when I first time looked the page I got into a tiny panic. But it was a creative one since I had to think a way to learn it and I took my musician skills to help me. In the higher level badges there are different kind of combinations of lines. I made rhythm patterns to remember them! Thin lines are short and wider lines of course longer rhythms. And it worked, in the first week I knew them all. Now it’s time to go to sleep and recover for the next week. 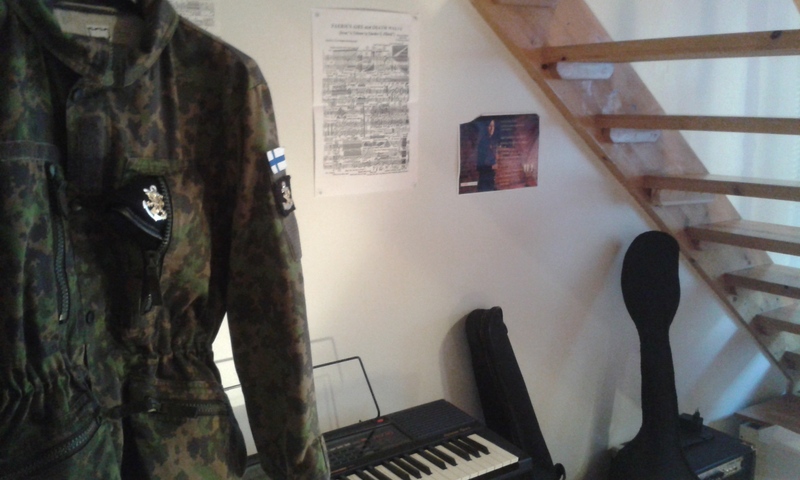 This entry was posted in Musician in the Army, musician's lifestyle on August 1, 2015 by helipauliina.